I love to juice! However, I must admit that I haven't been doing it as often as I was earlier this year. I was juicing almost daily but it had been a couple of months since I'd juiced. I think I just got lazy! Anyhow, when I made my juice last week I realized really missed it and I think my body misses it too. I plan to start juicing again a few times a week, if not daily, so I think this is a great time for me to share some of my favorite go-to vegetables & fruit for juicing & a few combinations I love! One of my favorite things about juicing is that it doesn't have to be exact! Lots of times, I just find myself combining whatever it is I have in my fridge and seeing what happens. Most of the time, they taste great, but sometimes the combinations just don't work. Like that time I thought I'd make my version of V8 because I had a bunch of tomatoes. That didn't turn out so great. It was like drinking bland & watery salsa. But, hey, here's trial and error and drinking your veggies! Posted in Food Friday and tagged with juicing, vegetables, recipes. August 2, 2013 by Jessie Emeric. I'm thrilled that so many people are interested in getting the recipes to the food I post on Instagram. (I'd love it if you followed along, if you don't already!) So, I'm starting this series to share some of my favorites. I love to cook and eat good food, but I am also a busy mom and I don't particularly want to spend hours in the kitchen. That's why I'm so bad at meal planning or doing meal preps for the week. Anyhow, back to the topic at hand. I like to make quick, easy, healthy meals for my family. I'm not really good at following a recipe, I like to improvise. a lot. And I don't really measure too accurately either. I'll share my step-by-step albeit vague directions and share the link to the original recipe, where there's one. Hope it helps & gets you to try something new! To kick off this "Food Friday" series I'll be sharing my favorite easy go-to side dishes. I really make these way too often. I need to add some variety into my dinners. Maybe I'll start experimenting soon...yikes! 1. Wash brussels sprouts, cut off stems and outer leaves. Cut in half. Place in bowl. 4. Place evenly on baking sheet. Bake at 375 degrees for about 30-45 mins. Brussels sprouts will be nice and crispy on the outside & soft on the inside. 1. Wash asparagus and cut off ends if they're dry. 3. Add olive oil to a large cast iron pan. 4. Throw in the asparagus and let it cook for about 5-10 min. 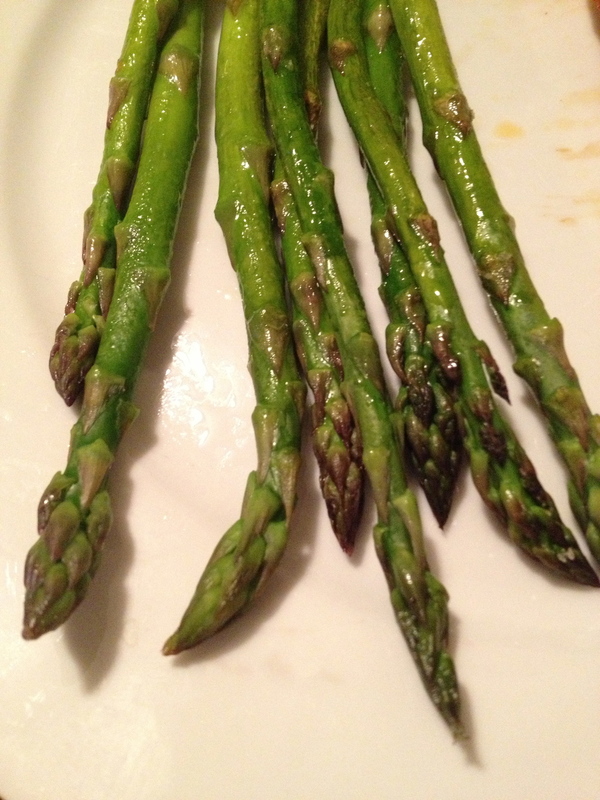 Toss the asparagus a few times while cooking. I don't like them too soft, but you can keep them in longer depending on how you like them cooked. * You could also add balsamic vinegar with the olive oil to these. I use the fennel seeds instead of the caraway - mostly because already had the fennel when I found the recipe. ps. I also promise better photos next time. These are all iphone shots for instagram! Posted in Food Friday and tagged with vegetables, recipes, side dish. July 26, 2013 by Jessie Emeric.